The term "threads" and "stringing materials" are often used to denote the same things - namely chains, jewelry wire, leather thongs, cords, and all kinds of stringing type materials that are used in making jewelry. 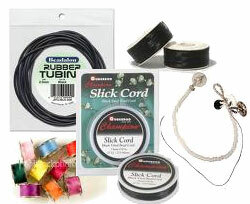 These variety of stringing materials are oftern available from the same sources as for jewelry tools, beads, and findings. Fabric and embroidery shops are also a good source of finding unusual and useful threading to incorporate into jewelry making. When choosing the right stringing threads, you need to consider the weight of your beads and the size of their holes. While keeping in mind the need for movement and flexibility in your strung jewelry piece, it is recommended to choose the strongest stringing material possible for the types of beads you have in hand. Find out more about the applications, sizes, and types of stringing threads. Polyester threads and specialised beading threads and wires are extremely strong. If you are following patterns, they will normally have recommendations and guidance tot he kinds of threads and stringing materials you need for your design. Once you have mastered a certain technique, you can vary your designs by experimenting with different kinds of threads.